Only about one-third of all patients, including thousands transferred from other hospitals, will get admitted to a University of Michigan hospital bed. The demand for emergency care has been growing at a rate of 24% each year. The number of patients admitted to the University of Michigan ICUs from the emergency department has risen 10% a year for at least the last five years. A new Emergency Critical Care Center is a pressing need for the University of Michigan Health system. The new EC3 will provide five resuscitation and trauma bays with nine other patient rooms for patients’ initial diagnosis and stabilization, and it will help the University of Michigan Health System meet a growing number of complex critically ill and injured emergency patients who require time-sensitive diagnosis and treatment to achieve the best outcomes. The EC3 will also act as a test bed of new ideas and make it easier for research teams to test new diagnostics, devices, monitoring equipment, and treatment strategies. These studies will benefit patients worldwide who suffer strokes, sepsis, hemorrhages, brain trauma, cardiac arrest, overdoses and acute lung injury. In addition, the new facility will serve as the training ground for new emergency critical care physicians. It will include post-residency training merging the skill sets of critical care with emergency medicine to give doctors expertise focused on the first hours after the onset of a major health emergency. The new Emergency Critical Care Center will forge a groundbreaking partnership between the University of Michigan and companies to accelerate the commercialization of new prevention, diagnostic and therapeutic products and improve the care and outcomes of emergency and ICU patients. Last year, the University of Michigan spent $1.3 billion on research and laboratory supply purchase, making the University of Michigan an attractive research market for laboratory supply companies. If you are a laboratory supply company, now is the best time to demonstrate your products to researchers and laboratory managers at the University of Michigan, Ann Arbor, and get your products and services to the new emergency center. Biotechnology Calendar, Inc. is organizing the 14th Annual BioResearch Product Faire™ Event at the University of Michigan, Ann Arbor, on July 24th 2014 to help laboratory supply companies to network with researchers at the University of Michigan. 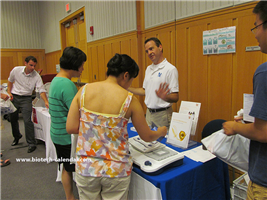 Last year, the BioResearch Product Faire™ event at the University of Michigan attracted 451 attendees. Of these attendees, 139 were purchasing agents, professors and post docs, and 64 were lab managers. These attendees came from 31 different research buildings and 71 on campus departments. Click the button below for more information about the BioResearch Product Faire™ Event on July 24th 2014 at the University of Michigan, Ann Arbor. 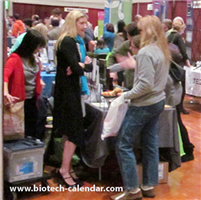 Biotechnology Calendar, Inc organizes more BioResearch Product Faire™ Events at different institutions across the nation. Please read the National Show Schedule for 2014.